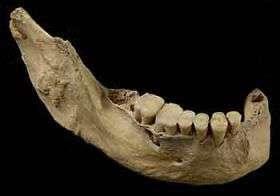 A mandible from a 40,000-year-old early modern human skeleton found in China and being studied by Erik Trinkaus Ph.D., the Mary Tileston Hemenway Professor of anthropology in Arts & Sciences. Researchers at WUSTL and the Institute of Vertebrate Paleontology and Paleoanthropology (IVPP) in Beijing have been studying a 40,000-year-old early modern human skeleton found in China and have determined that the "out of Africa" dispersal of modern humans may not have been as simple as once thought. The research was published in the Proceedings of the U.S. National Academy of Sciences on April 3. Erik Trinkaus, Ph.D., the Mary Tileston Hemenway Professor of anthropology in Arts & Sciences, his colleague Hong Shang, and others at the IVPP examined the skeleton, recovered in 2003 from the Tianyuan Cave, Zhoukoudian, near Beijing City. The find could help explain how early man moved across Europe and Asia towards the East, a movement that is not completely understood by anthropologists. The "Out of Africa" theory proposes that modern humans evolved in Africa and then spread throughout the earth somewhere around 70,000 years ago, replacing earlier humans with little or no interbreeding. The specimen is basically a modern human, but it does have a few archaic characteristics, particularly in the teeth and hand bone. According to Trinkaus, this morphological pattern implies that a simple spread of modern humans from Africa is unlikely, especially since younger specimens have been found in Eastern Eurasia with similar feature patterns. They argue that the most likely explanation for the mix of features is interbreeding between early modern humans and the archaic populations of Europe and Asia.